The PEI Potters Studio is a co-operative pottery studio for both new and experienced potters. We offer 10-week pottery classes for beginner and advanced potters that normally start in Sept, Jan and then either Mar or Apr. Our studio is open to our members whenever classes are not taking place. Membership can be purchased monthly or annually. First notice that our co-op will be hosting a Raku workshop on November 8th, 2015. More details as they are confirmed. Workshop normally open to co-op members and the public on a cost recovery workshop fee to pay for materials and the instructor. 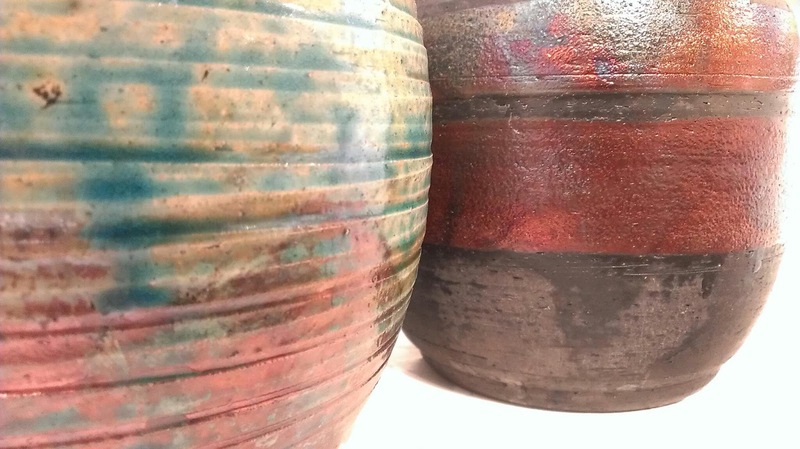 Raku is a process where the clay is heated up quickly using a propane gas burner, taken out of the kiln chamber while red-hot and then placed in a container vessel with organic materials (e.g. straw), which catch fire and consume the local oxygen so the glaze is in a reduction environment. This results in glazes from bright green to copper oranges and reds. Any part of the piece not glazed can turn black from the carbonized organics.